Home » Featured » How Many Chickens Do I Need To Keep? How Many Chickens Do I Need To Keep? One of the most common questions I get asked by people planning to keep chickens is the perennial “how many?”. It’s not as straightforward as you might think! A chicken of a good laying breed (e.g. Australorp, leghorn, Rhode Island Red, etc), less than two years old, can generally be counted on for 5 eggs per week while they’re laying. Often you’ll get 7 per week from an individual star performer, but if you average it over a small flock it’s more like 5-6. So, if you wanted a dozen eggs per week, you should start with at least three good chickens. I’d hedge my bets and add a fourth, which gives you excess to give away during summer and will keep your supply up well into late fall/autumn and early winter. Which brings us to seasonality. 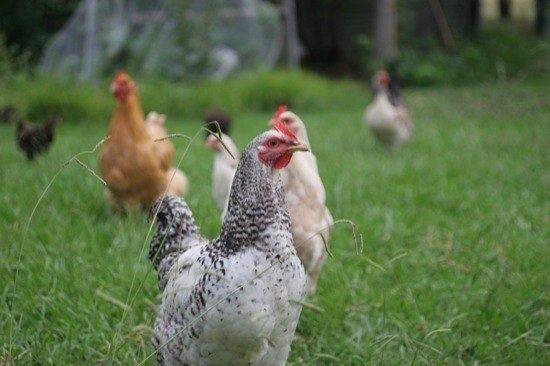 Chickens generally lay well through summer, and in late fall/autumn their laying rate drops. During winter, laying can drop to just a few eggs per week or even stop entirely, depending upon how harsh your climate is and how short the days are. They then start laying again in spring and are quickly back up to almost an egg per day again. You can compensate for seasonality to some extent by keeping an extra hen or two, and stockpiling eggs for the lean months. Eggs can last for 2-3 months in the refrigerator, although their quality does deteriorate during that time (the whites get thinner, and the yolks won’t sit as high). Eggs can also be frozen (not in the shell!) to use in cooking. Some breeds (in particular Australorps, Orpingtons and Faverolles) are often claimed to be good winter layers, which can help you through the down time. If you have them available in your area, they may be worth investigating. If you decide to keep a “fancy” breed rather than a “laying” breed, you can expect less eggs per week; perhaps just 2-3 per hen. These breeds have, after all, been developed for looks rather than economic output. Eggs aren’t the only reason to keep chickens! If you want the eggs, though, you’ll need to keep more of these breeds. Bantams can be just as productive as their larger counterparts, but they lay smaller eggs – so you’re going to need to keep more of them for the same weight of eggs. If you don’t go through many eggs, and just want a half-dozen or so per week, I don’t recommend keeping a single chicken. They are social creatures, and don’t do well alone. Instead, look at getting a couple of attractive chickens of an heirloom breed – their lower productivity will work for you, and they’ll make a beautiful and unusual addition to you backyard. Chickens are generally most productive up to two years old, and their weekly production tapers off beyond this point. Many people replace their chickens every 2 or 3 years to compensate. It can be a good idea to replace 1/3 to 1/2 of your flock each year, so you keep a range of ages and maintain a healthy flock structure. The older hens will keep the younger ones in line! One really clever idea someone once mentioned to me was to replace 1/3 of your flock each year, but choose a different colored breed each year – e.g. white the first year, brown the next, and black the following year. That way you always know at a glance which are your oldest birds, and therefore which to get rid of each year. Just remember, when working with nature you don’t get the predictability of an industrial process. There will be variability in your egg numbers each week. Fortunately, having too many eggs is rarely a problem – friends and neighbors will be more than happy to take your surplus, and many are even willing to pay you for the privilege!